So, here's the thing. I have a slight shopping problem. Ok, not so slight. 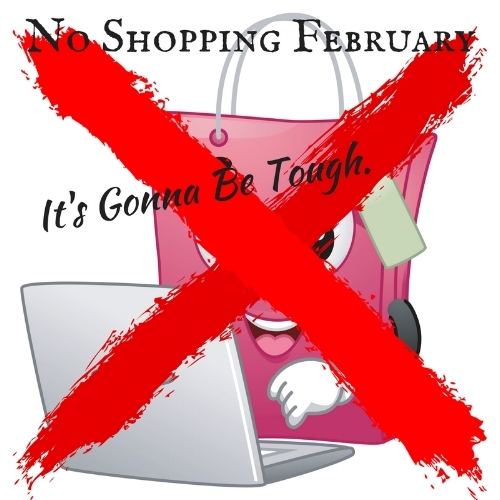 It's enough of an issue that I've decided to take drastic measures: I am not going to shop (for anything other than food and actual necessities) the entire month of February. Sure, I chose the shortest month (in not a leap year) for a reason. I didn't choose all of lent (like I have in the past) for a reason. I am actively making it as easy on myself to stick to as possible. But here's the thing - I want to stick to it. I told my friend Tamara this the other night as I reasoned that I needed the 12 bottles of wine (yes, for real. 12 bottles) because I wasn't going to shop in the month of February and she laughed at me. Understandably. I love clothes. I love to try new things. I am a product junkie. I made sure to buy the things I actually need (that aren't actual necessities) in January. For example, my curling wand finally went to hair tool heaven and the panic attack that ensued assured me that I needed to purchase one quickly. I decided to take the opportunity to buy 3 different styles (all returnable after trying!) and try them in order to share my results with you lovelies (Look for an analysis in the future!). I am hoping February 2018 will help my bank account out a bit and also get me to try some new things as distractions. To be completely transparent: I am keeping my Rent the Runway Unlimited subscription (because I am obsessed with it), I may have done a bit of overboard shopping in January which prompted this, and I have a Trunk Club and Wantable coming because I wanted to do a comparison. Le sigh. I admit, I am not the best at this.. But! I will continue to share my loves, the products that mean the most to me, and the books I am reading. For example, I TRULY DO use my Instant Pot at least 4 times a week. It has changed how I eat and cook. I really do love my hair wands and will let you know which one I deem best. Speaking of hair, I am obsessed with Living Proof's Dry Shampoo, Perfect Hair Day Shampoo and Conditioner, and Ouai's Hair Oil (that smells like heaven). And I will be obsessively tracking my steps and activity via my FitBit Alta HR to stay busy. Wish me luck. February is only 28 days..